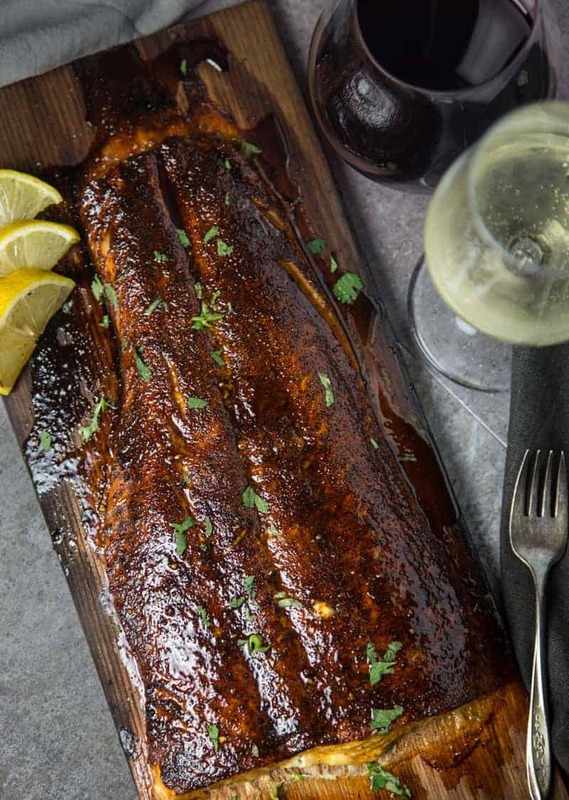 Cedar Plank Salmon is amazing when coated with a sweet and spicy dry rub, cooked on the grill giving it that smoked influence, and finished with a maple syrup glaze. Sweet, spicy, and absolutely incredible. And if you don’t have a grill you can easily do this in a hot cast iron pan and finish in the oven. Yeah, good luck with that one, kid. So to keep the newly discovered pesca-bacon-tarian happy we’ve been cooking a lot of fish, though not wrapped in bacon. We love playing around with different flavors when it comes to grilled salmon. It doesn’t take much time to grill, so cooking it on a cedar plank can help you get some of that great smoky flavor when you cook it hot and fast. 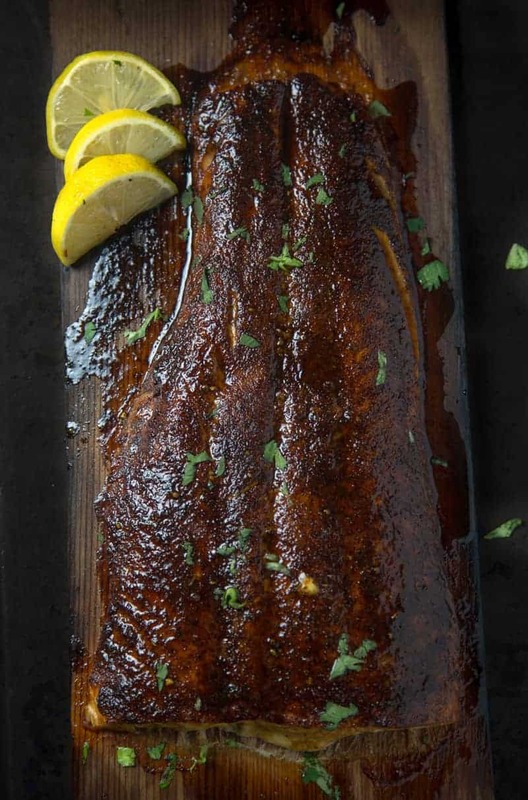 This is a fantastic Cedar Plank Salmon recipe for dinner on a weeknight (or weekend, when you just don’t feel like smoking it low and slow). It is very important to properly prep your cedar plank before you grill your Salmon. Obviously, wood + fire = more fire. 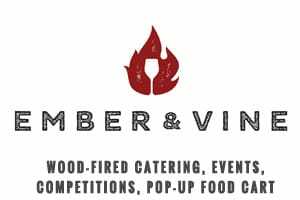 The last thing you want is your cedar plank AND salmon filet to go up in a blaze of glory. So, soak your cedar plank, fully submerged in water, for at least 30 minutes!! No short cuts here, keep it in for the full 30 minutes or you’re gonna have a fire on your hands, and not the good kind of fire if you know what I mean! Now, pat your soaked cedar plank dry to absorb the excess moisture, and you are ready to grill your Cedar Plank Salmon! 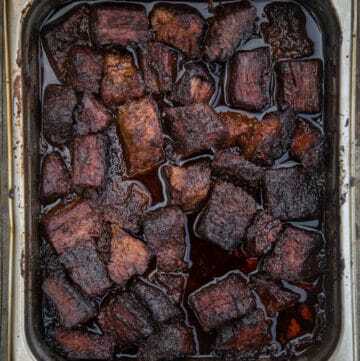 which gives it a sweet, and smoky flavor with a little heat at the end. *Note: you may not use all of the dry rub on your salmon depending on the exact size of your fish. Just save the rest in a small jar and use for future recipes. This rub is also great on pork and chicken (or tofu if you’re avoiding the other “meats”, like my son). Prep your grill for indirect cooking. 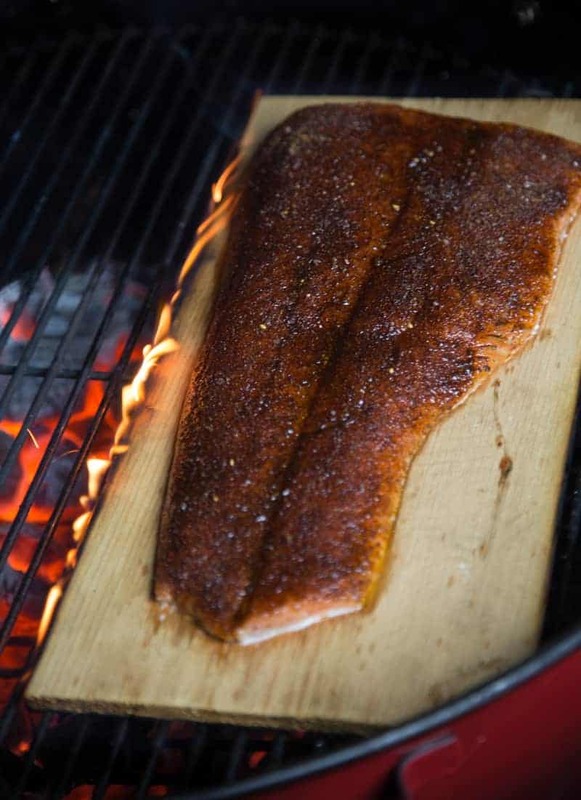 Coat your fish with olive oil and liberally season it with the salmon dry rub, then place it on the the cedar plank. Now place the Cedar Plank Salmon over direct heat. Cook for approximately 12-15 minutes, monitoring it for flames, until the internal temperature of the salmon reached 120 degrees using a digital thermometer. (You will want to be sure you soak the plank to avoid it going up in flames. It may catch a little on the sides (which is okay! 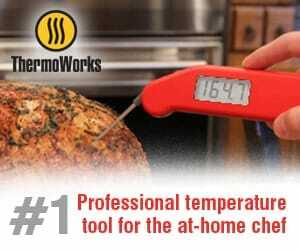 ), just be prepared to move it early to indirect heat to finish. After the salmon has reached 120 degrees move to the indirect side leaving grill uncovered, and then coat with the maple syrup, and let sit for about 1 minute to caramelize. Remove from heat and rest for roughly 5 minutes. The carry-over heat will continue to cook the salmon to 125 degrees (medium rare) over that time and the maple syrup will firm up slightly. Time to serve and enjoy this pesca-bacon-tarian friendly meal. Can You Reuse a Cedar Plank? No, once you have used the cedar plank it is not reusable. Between raw fish and the primary flavor being consumed from the fire, it should be disposed of. If you have a smaller cut, consider before cooking, sawing the plank in half so you can make it last. Sweet, spicy, and absolutely incredible. 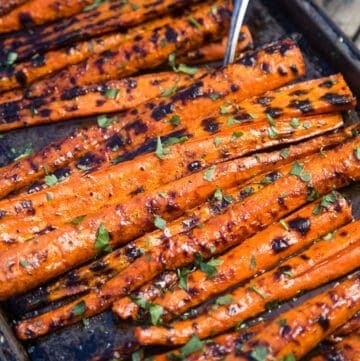 And if you don’t have a grill you can easily do this in a hot cast iron pan and finished in the oven. Soak the cedar plank, fully submerged in water, for 30 minutes. Pat dry after removing from water. Combine dry rub ingredients in a small bowl. Coat salmon with olive oil, and then sprinkle about 2 tablespoons of the dry rub over the salmon liberally (you may have some dry rub leftover). 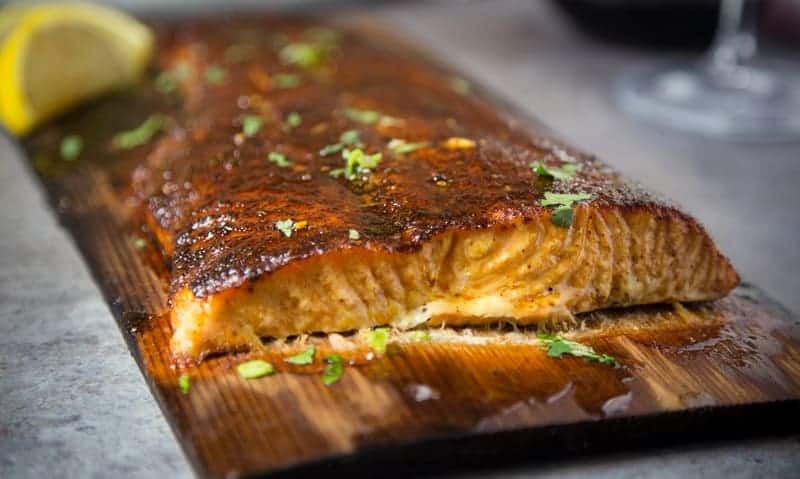 Place seasoned salmon on the cedar plank, and place on direct heat for up to 15 minutes or until the salmon reaches an internal temperature of 120 degrees. 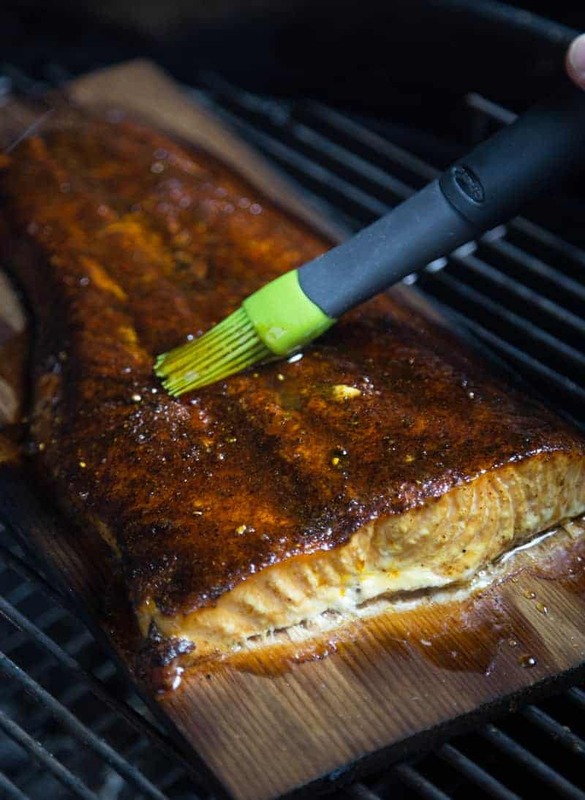 Transfer the salmon and cedar plank to indirect heat, and glaze with the maple syrup using a brush. Remove after one minute. Let rest for five minutes and then slice and serve. *Notes: you can also cook the salmon in a cast iron pan. It will need to be cut into smaller filets to fit into the pan. Cook on the stovetop until the salmon reaches 120 degrees, then coat with maple syrup and finish under the broiler for one minute to caramelize the maple syrup. ** Depending on the size of your salmon, you may have some leftover dry rub. Make sure to liberally coat the salmon though. Don't be shy! 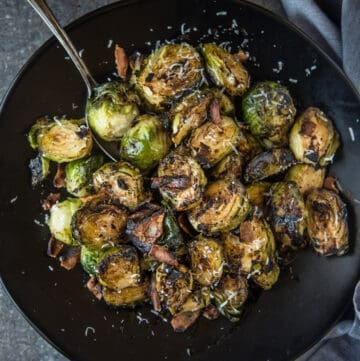 I have two go-to pairings for this dish – a semi-sweet Riesling and new world style Pinot Noir. Salmon, in general, tends to have delicate flavors and textures, but this one, coated in that sweet, spicy, and savory rub and maple glaze, offers the opportunity to pair it with something a little bolder. 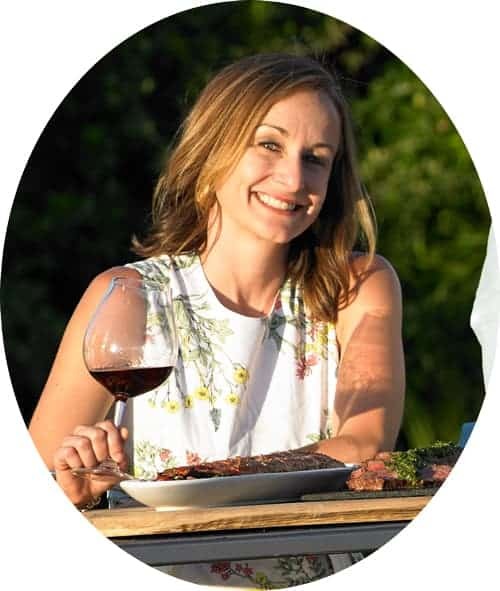 If you go for a medium-bodied fruity Pinot Noir from California, for example, you’ll find a nice match up in bold fruit balancing out the flavors in the rub, yet smooth enough to pair with that tender delicate meat under the rub. We tried this with the 2015 Siduri Pinot Noir, Parsons’ Vineyard from the Russian River Valley, in Sonoma County, and it was a great matchup for all of the above reasons. Alternatively, we love Riesling with this. If you find the dry rub to be on the spicy side (this will depend on the strength of the chipotle powder you have), the Riesling will provide a refreshing and sweet contrast to the heat. It will also balance well with the sweetness in the dry rub and maple. It’s a pretty versatile wine that works great with the flavors in this dish. Just look for one on the slightly sweet side (you don’t want a bone dry Riesling for this, and nothing on the sticky sweet side). This was nice with a Dr. H. Thanisch, Müller-Burggraef, Bernkasteller Badstube Riesling Kabinett from the Mosel, Germany. It had great acid to counter balance the sweetness. 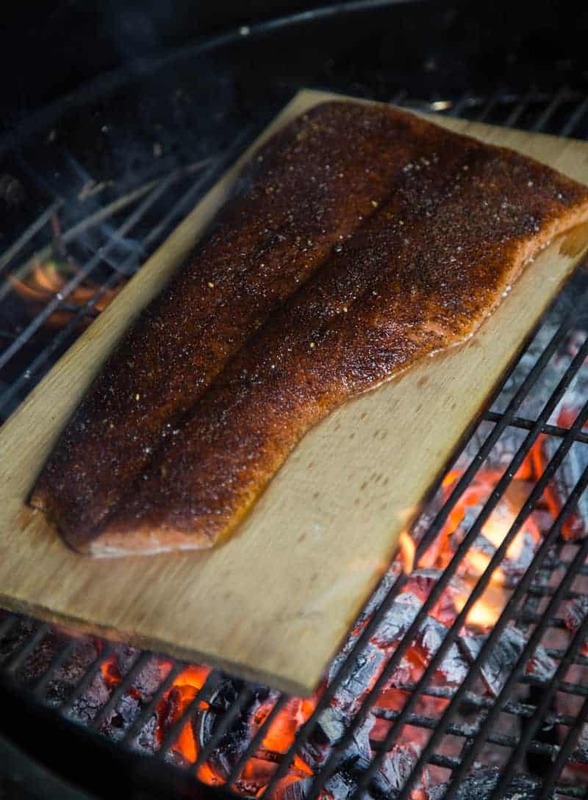 We still have never cooked salmon on a cedar plank, but your post makes it look soooooo good—and not intimidating! Hi! 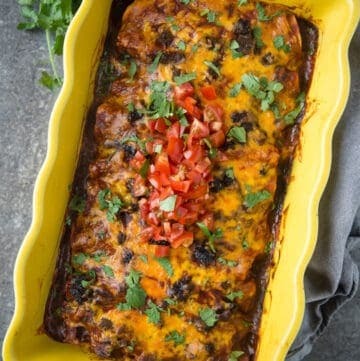 Just pinned this from FBC, and had to come over to look at the recipe. 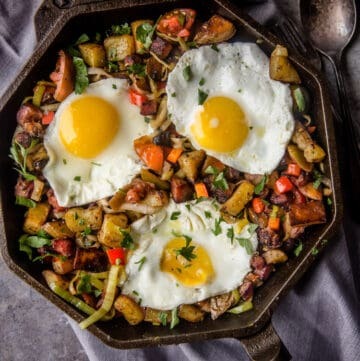 Your gorgeous photo lured me in — it just looks SO incredibly delicious! Yum! Look at that gorgeous maple glaze! This salmon looks AMAZING, Mary!! 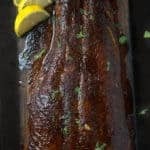 I’ve long been a fan of cedar planked salmon but your version, with the delicious maple chipotle glaze sounds extra fantastic Mary! Thank you and I seriously cannot make this stuff up!!! How to cook salmon skin When salmon is boiled, smoked, or steamed, the skin can become soggy and rubbery, which is not very pleasing to eat. However, when grilled, seared, or fried salmon skin becomes crunchy and is full of flavor because of all the fats in the skin. Cooking salmon with the skin on Some people prefer to cook salmon with the skin on. Cooking the salmon this way helps stop the delicate flesh from drying out. Crispy salmon skin can also add a different texture to the dish. When cooking salmon on the grill, leaving the skin on can protect the meat underneath from burning. Salmon bacon One of the simplest ways to prepare salmon skin is to make “salmon bacon” or “salmon rinds,” which are thin strips of salmon skin fried in oil. separate the skin from the fish cut it into 1-inch strips and dry them with a paper towel — it may take some time to get all the moisture from the skin, so be patient add cooking oil to a skillet and put over medium-high heat when the oil is hot, add the dried strips of salmon skin to the pan turn the pieces as needed to keep them from burning when crispy, remove the strips from the pan and drain them on a paper towel to remove excess oil add salt and seasoning to taste This simple recipe can be adapted to fit almost any meal and is a simple way to add salmon skin to the diet. Risks and side effects Fresh wild-caught salmon may be recommended to avoid potentially contaminated fish. There are a few important things to consider before adding salmon skin to the diet. It is essential to know where the salmon comes from before eating the skin. I wish we had a bbq! This sounds so good. We love salmon but don’t make it at home very often. That glaze sounds delicious! Any chance you could tell me how to do this on my pellet smoker? It looks amazing and I would love to surprise my husband with this! Shannon, what type of pellet smoker do you have? I ask because some allow easy access to remove the difuser plate so you can get direct heat over the flame. If you can do this, I would replicate the direct heat over your flame and then if needed, move the cedar plank to indirect. If your pellet smoker can get to 400 + degrees and you can’t get direct flame access, then crank the heat up as high as you can, and then follow the method using the high method. What is key, is that the plank flavor really gets into the meat when it slightly combusts. For that you need that direct heat.